Your business is important to you, and without exploring different services available to promote growth, such as cloud managed services, you may be putting your company and employees at a disservice. Without cloud services, you can’t compete. Without managing your cloud services, your business is at risk of security threats, data loss, and the costly downtime that follows. It’s possible you haven’t heard of cloud managed services or know little about them. So first, let us explain. Cloud managed services are outsourcing services to help manage your daily IT needs. These services are designed to automate and enhance your business operations. In many cases, a company's IT department doesn’t have the time to dedicate to assisting an entire organization’s IT infrastructure, or they sometimes don’t possess the skills to monitor and maintain a cloud environment effectively. Remember, whether it’s you or an outside services provider, your data in the cloud has to be managed by someone. 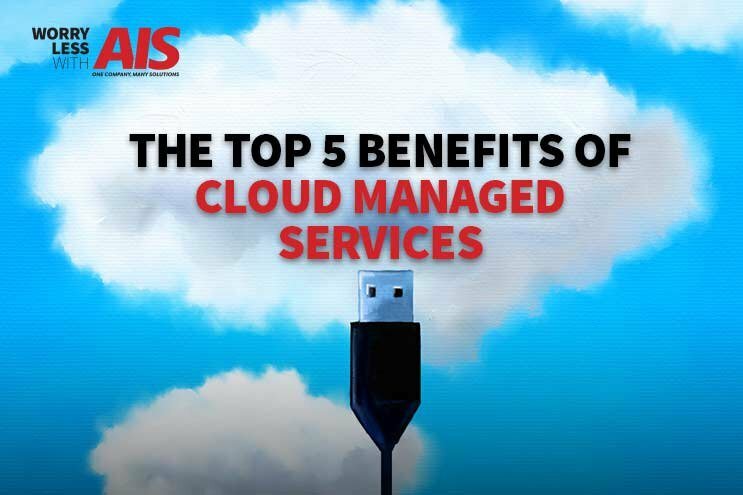 If you’re thinking of outsourcing your IT management to a cloud managed services provider, you’ll want to read our top 5 benefits of cloud managed services. Cloud managed services give you the flexibility to help manage what you’re spending on these services and how often. A great cloud solutions services team allows you to decide how much you’re willing to pay for IT services by having a consistent and predictable monthly bill. By outsourcing your cloud managed services, you’ll have peace of mind knowing you’re in control of the costs associated. Not to mention, you can even reduce costly network maintenance expenses. Staffing an entire IT department in-house is expensive and often unnecessary for small to medium-sized businesses with less-complex networks or cloud infrastructures. Switching to an outsourcing company that helps manage your cloud environment is the first step in future-proofing your information technology hub. Once you do so, you’ll be amazed at the new technology systems and software applications specific to generate money and keeping your business safe. When your business hires an in-house “IT guy” or even an IT department, you then have to spend extra time and resources training them. Not to mention, paying their salaries and extra benefits, such as 401K and health insurance. Cloud managed service providers not only cost your company less but are always up to date on the latest and most significant technology trends hitting the market. Now more than ever, it’s becoming more and more important to protect your network from cybercriminals and online attacks. What kind of network security plans does your business have in place that helps prevent these cyber attacks from occurring? What’s your plan if a cyber attack does, unfortunately, occur? Utilizing cloud managed services is a great way to stay on top of your network's security, especially when it comes to being proactive, instead of being reactive. Read an article published by Computerworld to learn about outsourcing your IT for security purposes, Outsourcing IT to Mitigate Security Risks. When it comes to protecting your network, it’s always best to nip a security breach in the bud, before it ever has the chance to gain access to your files and data. A great cloud managed services provider offers security and disaster recovery services for your office equipment and files to ensure your big data remains safe and secure across all platforms and applications. In the unfortunate event of a disaster, your business and operations can continue to function without facing hours, or even days, of downtime. To learn more about cloud security, read our article, Cloud Backup: More Security than In-house. One of the best ways to stay on top of all aspects of your business is by having quick resolutions, especially when you’re outsourcing different tasks or services. Your ultimate goal is to find a cloud managed services provider that resolves service calls that you place to them, almost immediately. Even if they can’t initially resolve the problems that are occurring, they should still respond quickly (within 2 hours or less) to let you know they’re on it and working on solutions. This means that most service calls placed to the cloud managed services company by the customer are resolved in a single visit. We don’t know about you, but we think returning to full productivity in just one call is priceless! When it comes to your technology, it’s critical to have an infrastructure that can support your business needs and the needs of your customers and employees. Cloud managed services providers that offer 24/7 or, real-time monitoring and management are ones you shouldn’t pass up. Depending on your service level agreement or contract, your cloud managed services provider can monitor and scan your network for patch requirements, security, and more. A great cloud managed services team also spends time making sure the union from your old systems smoothly integrates with the new ones they set into place. This type of cloud migration or digital transformation ensures that the practices and policies you’ve set for your business correspond with any new goals or operations. If you need more assistance when it comes to working with your cloud managed services consulting partner, read our article, 5 Questions to Ask Your Cloud Partner About Compliance. At AIS, we know how important it is to make sure your business runs smoothly, especially in an unfortunate instance of a natural disaster or cyber attack. We’re here to provide you with the knowledge and resources, so you know the best ways to protect your business, while also saving money in the process. If you’re interested in learning more on cloud managed services, or any other services we provide, reach out to one of our business technology consultants, here. We’re here to give you peace of mind to help you win more business. Mo is the resident IT go-to lady at AIS. She has traveled the world, run a marathon, is a self proclaimed crossword champion, and can do ventriloquism. She has an uncanny memory ....down to the detail. She has completed 4 half marathons and hates running. In her free time, she likes to spend time with her 7 siblings and 20 nieces and nephews.